The imagery of soaring eagles has inspired mankind for generations. 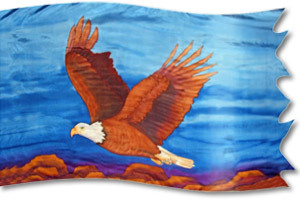 This banner portrays an eagle soaring across a pale blue sky while looking down on the land below. The eagle’s large wings depict its strength and power while the paleness of its feathers represents the lightless of being carried up and away in an act of redemption, a metaphor described in Exodus 19:4. The hovering, protective aspect of the eagle is highlighted in this banner, as it soars high, circling over the heads of worshippers. The form of the bird on the banner can vary on different continents depending on the local species. The characteristics of this bird are frequently referred to in the Bible: its swiftness (Job 39: 28, 29; 2 Samuel 1:23), its building in high cliffs (Jeremiah 49:16), its powerful sight (Job 39; Deuteronomy 32:11), its great powers of flight (Proverbs 30:19) and its teaching its young to fly (Deuteronomy 32:11). God's powerful redemption is likened to being lifted on the wings of an eagle in Exodus 19:4 and His caring protection is described as an eagle hovering over her young in Deuteronomy 32:11. God’s ability and strength to support us is beautifully portrayed as being lifted on the wings of an eagle in Isaiah 40:31. Eagle, Soaring, Redemption, Protection, Majestic, Hovering, Wings. Indigo: Kingdom authority, Intercession, Mediator, Power, Maturity, Selflessness, together with reliance on and submission to God (Revelation 9:17; Revelation 21:20).